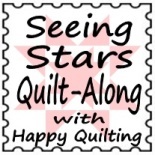 There are a few quilting blogs that I follow, Melissa Corry of Happy Quilting is one of my favorites! I have sewn a couple of her patterns and I think purchased just about every other one that are all on my wish list. She’s done a few quilt alongs over the past couple of years that have tempted me, but for one reason or another I decide to just watch and drool. Well, she’s starting a new one that I’ve decided to jump in and sew along. The toughest decision was what fabric did I want to use for my stars. I finally decided that since I was being brave and daring to sew this sew-along, I was going to finally cut into my Vintage Christmas and make me a Christmas quilt. Take a look at these colors, here’s the reds and aqua – the pictures I took at 5:30am in the basement don’t do them justice, believe me when I say the colors are beautiful! Super excited, the individual steps will come out every Wednesday between now and the middle of October. I’m not too sure about the applique stars, I might end up replacing those with something else, but who knows, maybe I will be super brave and daring and give them a try also. 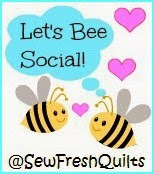 So, for today, here’s my fabric and public accountability that I’m going to do this! Melissa, thank you for your comment. I’m not ready for matching stipes! 🙂 I really love the metallic silver dots, and as I was looking for yardage for that I found another line, have you seen Holly Woods by 3 Sisters? OMG! it’s gorgeous. As I was trying to decide if I wanted to make a red/white/blue quilt (because I’ve been wanting to make one), or a Christmas quilt (because I’ve been wanting to make one) for your quilt along. I finally decided on the Christmas, but now I’m wondering, would it look too odd if I had the red/while/blue Christmas fabric quilt out during the summer? These will look beautiful! It will be wonderful to have a Christmas quilt, too. I decided on a red/white/blue quilt for this quilt along and will be posting by fabrics soon. I’ve always wanted a “patriotic” quilt, also. Have fun on this quilt along!